A few weeks ago we noticed a bit of bioluminescence in the water at night, just a bit of sparkling. We have seen this out in the gulf stream, and all of us think it’s pretty cool how the plankton can glow when disturbed. Over the weekend we decided to brave the no-see-ums (who do not respect bug spray at all) and check it out again. What we saw was unlike anything we’ve seen before. We felt like we were walking onto a set of the movie Avatar. Any disturbance, from a splash or a fish, caused the water to glow blue-green quite brilliantly. We ended up sacrificing our ankles to bites and sat on the sugar scoops playing in the water and watching in amazement. We could see every fish swimming around, as they would disturb the plankton and cause the water to glow with their movement. Each droplet of water was an individual light show. When the girls stuck their hands in the water, the plankton would stick to them and make sparkly and glowing spots on their skin. 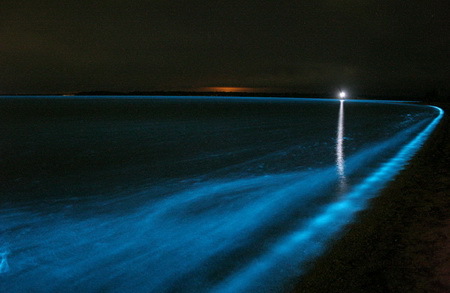 Turns out this is a special summertime event, caused by a special kind of plankton called dinoflagellates. We tried to get photos and video of the girls playing with the bioluminescense, but it just wouldn’t show up withe camera equipment we’ve got. I did find this great Discovery News video, which shows the phenomenon in San Diego. Turns out there is a whole industry developed around playing with the dinoflagellates in Florida during the summer. Midnight kayak tours, complete with glow sticks, allow you to float and glow paddle through them. Simply amazing to watch. We decided we need to get a portable microscope, so we can see our dinoflagellates up close and personal. ← A new spot to relax!